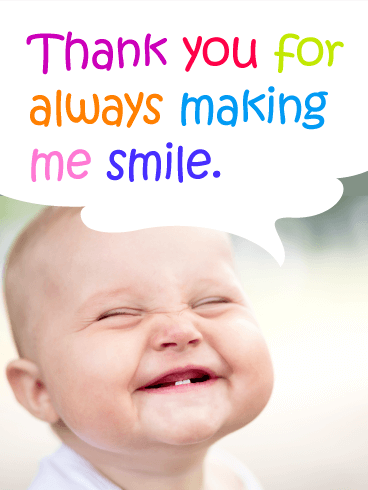 It takes a special someone to make you smile on a bad day, so make sure you tell them 'thank you' properly! Whether they make you grin widely or barely smile, each moment of happiness is a gift from a friend and should be properly acknowledged. And what better way than a thank you card capable of returning the favor? Want to make someone smile while also saying thanks? This card is a the perfect pick! 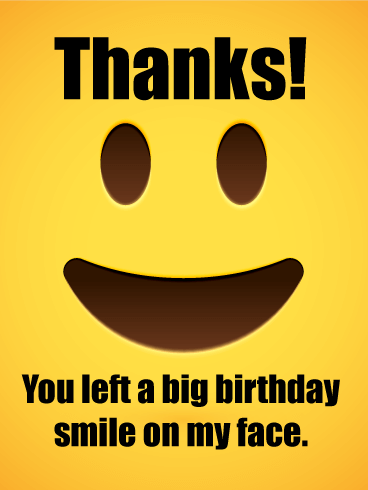 A happy face emoji will get the message out that you're grateful for their birthday wishes. And the words are sure to remind them what a big smile they left on your face that day. Send this greeting and they're sure to be grinning just as wide! 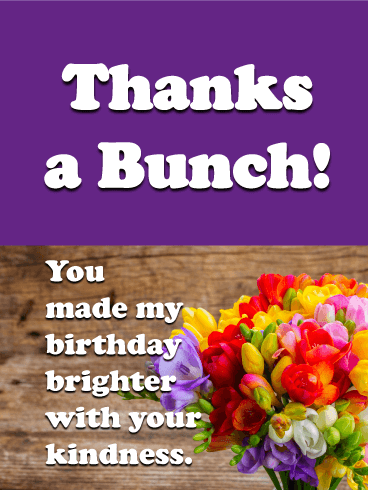 Say "thank you" in a fun way with this bright, exciting Thank You card. This is a versatile card that can be used for any occasion, but it's especially great for springtime with the pink and purple colors. Show someone you care with this beauty. Is there anything cuter than a puppy in a bowtie?! 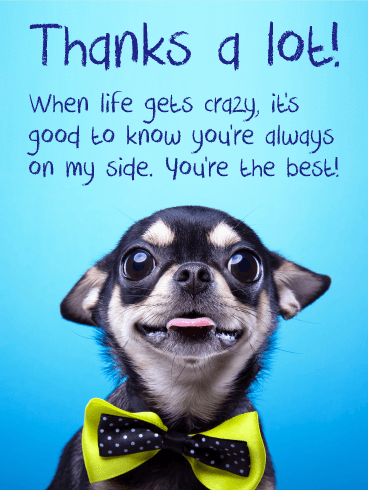 Dogs are known as "man's best friend", which makes this Thank You card a great pick for someone who's always by your side. If you want to tell a dog lover how grateful you are for them, go fetch this one and put it in your cart! Not all that glitters is gold. The kind and thoughtful people who fill our life with meaning are worth their weight in jewels. 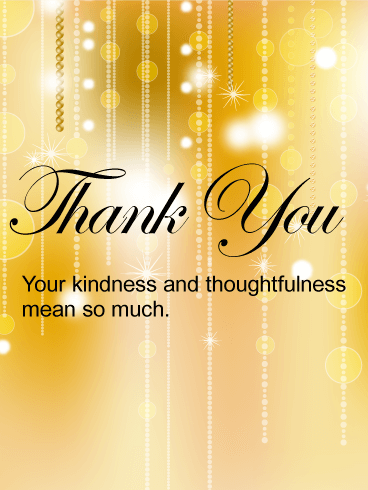 This gold thank you card takes all the kindness that’s been bestowed on you and reflects it back to those who have graced you with their time and thoughts. For friends near and far, let them know how much you value them. 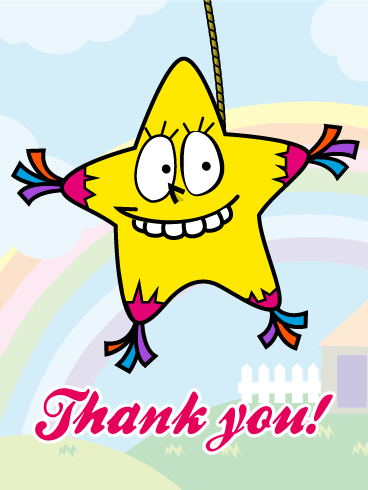 This Star Piñata Thank you card is perfect to amuse someone and make him/her smile. 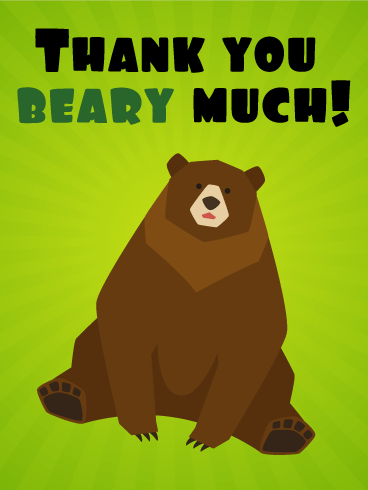 If you feel like sending a pop thank you card, choose this one. 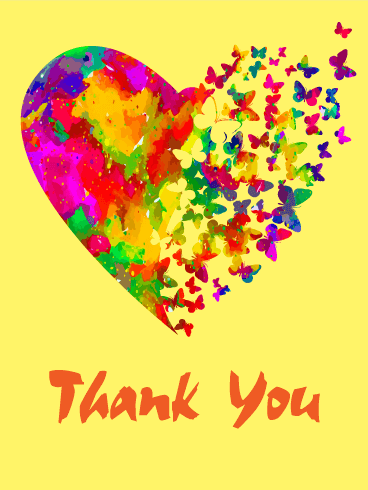 Sending thank you cards often will bring you and other people happiness and joy. A blooming bouquet of flowers against a rustic wood background is a very charming way to say thanks a bunch! 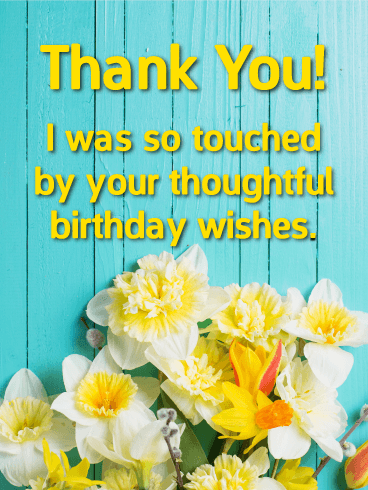 If they made your birthday brighter with their kind words, send this card to let them know how much it meant to you, and how you'll remember their thoughtfulness all throughout the year. They really touched you by sending a birthday card to help you celebrate. And this lovely thank your greeting is guaranteed to have the same effect on them. Beautiful yellow and white blooms are set against a bright blue wooden background for plenty of charm. And your gratitude is made clear in the words above, letting them know how much you appreciated their kind wishes. When it comes to saying thanks, a card featuring a cute cat is always the "purr-fect" choice! 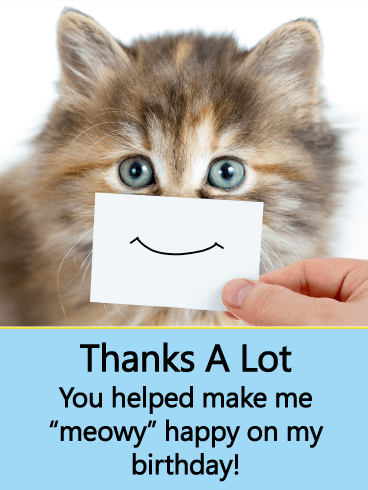 This greeting lets you show your gratitude with the help of a sweet kitty wearing a smile in front. It's a fun way to let them know they helped make your birthday celebration "meowy" happy from beginning to end. You can be sure they'll be grinning from ear to ear when you send it. This dapper doggie is here to help you say thanks for their thoughtful birthday wishes! He's all decked out in a bright red bow tie and ready to let them know that you'll "fur-ever" be grateful for the kindness they showed you as you celebrated such a special day. When you send this adorable greeting, you can be sure they'll remember it for a long time to come. A cheerful yellow sunflower is set against a bright blue sky background. It's the perfect scene for sending someone special your thanks for their birthday wishes. You were truly filled with happiness and want nothing more than to send that same feeling back to them. This is just the greeting to do it! 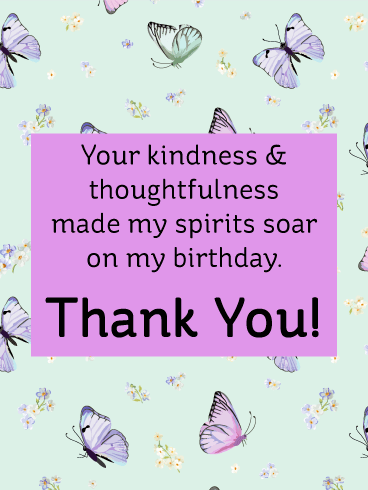 A pale blue background with pretty pastel butterflies floating all around will fill them with happiness while helping you say thanks for their thoughtfulness. Their kindness made your spirits soar as you celebrated your birthday, and you're hoping this charming greeting will do the same for them. Nobody deserves it more. 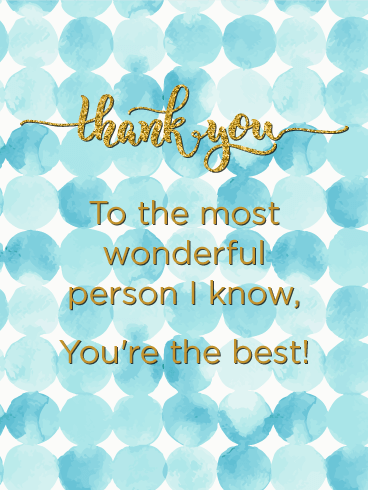 If you're so very thankful for their thoughtfulness, this card will let them know. 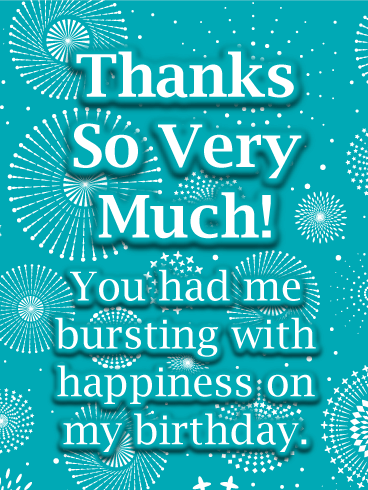 A teal blue background is bursting with white fireworks and stars, reminding them how you were bursting with happiness when they reached out to you on your birthday. So if you want to send a greeting to show just how grateful you are, this is the perfect pick. 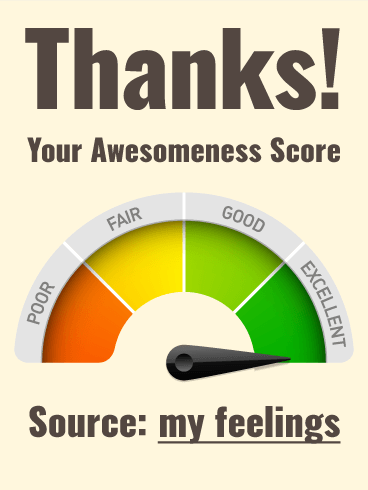 If words are not enough to express how awesome someone may be for what they did for you, then show them they are on the far end of the excellent scale with this visual thank you card. It will tell them that you took the extra effort to find the perfect card to say thanks! 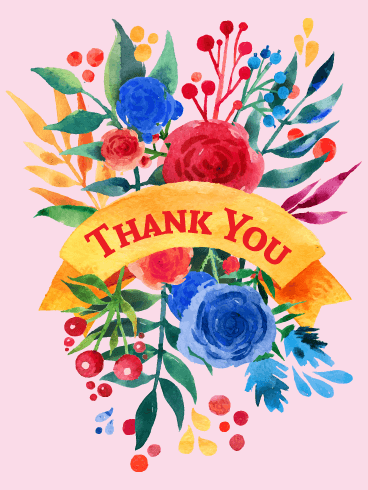 This thank you card was designed with vivid colors that will capture the reader's attention instantly, and give them the thanks they deserve! Who says thank you cards have to be simple? This thank you card takes saying thank you to the next level. 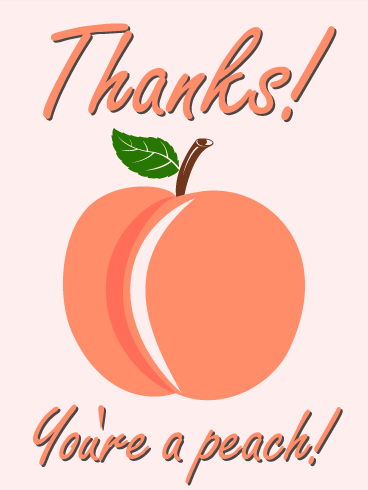 After all, what's more suitable than having "peach" written in a peach color?! 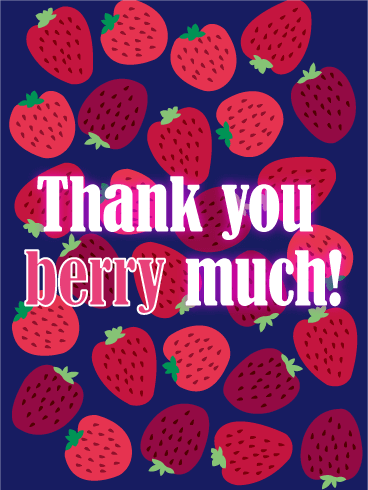 This thank you card will make anyone smile, and it definitely stands out amongst other thank you cards. 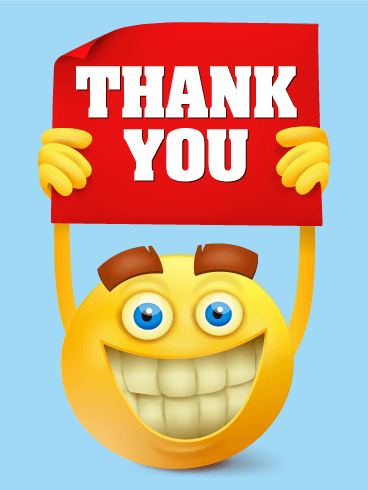 When someone does something nice for you, the best way to show your gratitude is with a thank you card! 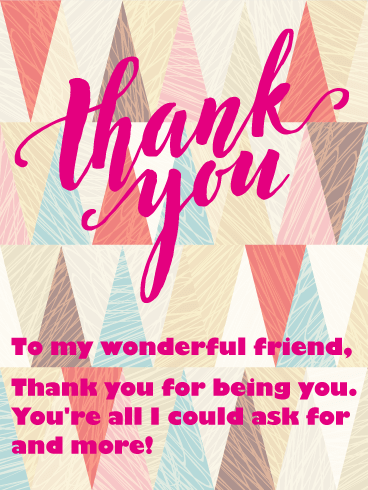 Your friends and family deserve the best, even when sending a thank you card, so use this cute and silly card to show your appreciation. The fun design will make them laugh and show how much you care for them and their kindness. Send it today! 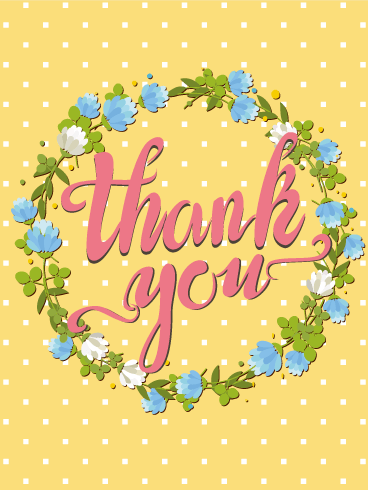 Take your thank you cards to the next level with this exciting, one-of-a-kind thank you card! The pink balloons scream excitement, while the script font adds a touch of elegance. 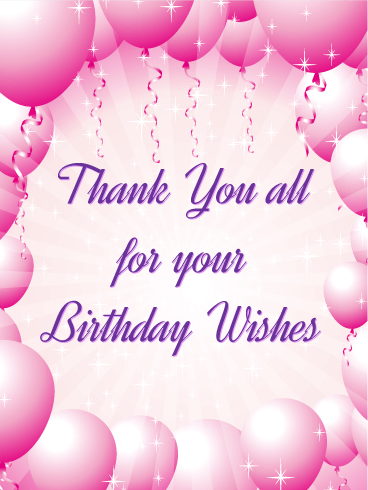 If you're looking for a memorable way to say thank you for all of those who have helped celebrate your birthday, this is the thank you card for you! 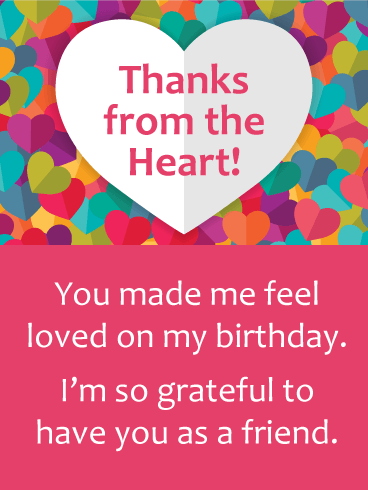 Let someone know you're appreciative of them with this fun card! It's perfect for the art lover in your life, with its bright colors and unique geometric design. You can't go wrong with this pink-colored gem! 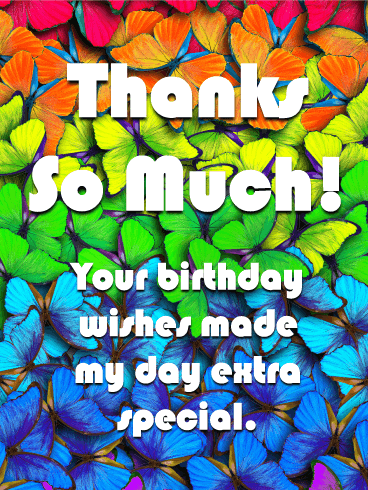 The variety of blues on this card makes it truly stand out amongst other "thank you" cards. Just look at those beautiful butterflies and flowers! 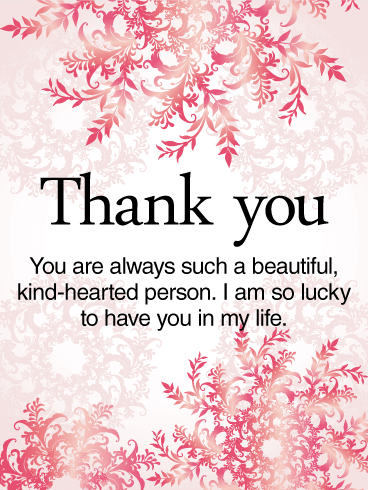 If you're looking for a card to let someone know how thankful you are for them, you can't go wrong with this one. If you want to make someone feel good about themselves, this card is a must-have. The wording is generic enough that it can apply to almost any situation, but it's heartfelt enough that it seems personal. You can't go wrong with flowers on a card, either! If the friend, family member, or colleague you're thankful for is a bit quirky, this is the card for them. The purple background is subtle, while the bird on the flower branches makes for an eclectic addition. It's a great choice! Isn't this Thank You card absolutely stunning?! The coloration of the flowers is gorgeous, and the sentiment is beautiful. 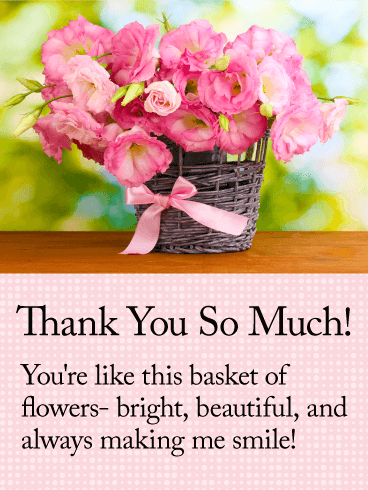 For the special person in your life that always makes your day that much better and brighter, this Thank You card is an absolute must-have! 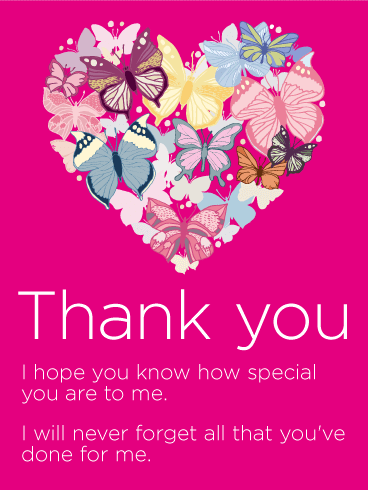 While the soft pink of this Thank You card that captures your attention, the beautiful butterflies that form a heart are what makes this Thank You card a true keeper. 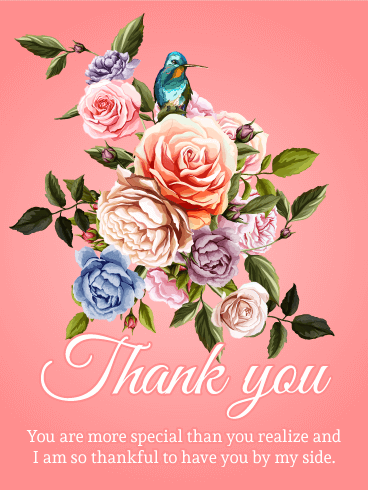 The delicate look of this card is wonderful, and the kind verbiage will let the person you're giving this Thank You card to know how much they mean to you. Just look at this color scheme... absolutely stunning! The blue polka dots make for a fun background, while the glittery gold wording is eye-catching. 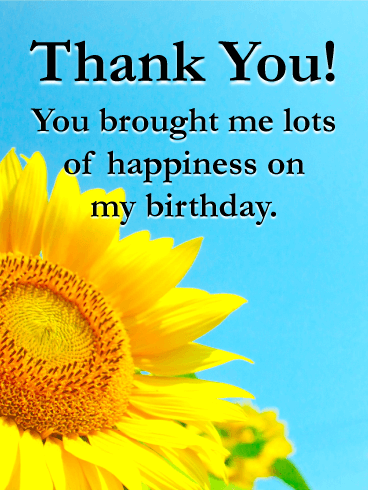 This is a versatile card that can be used for a variety of occasions, such as thanking someone for helping you move, thanking them for a gift, or thanking them for treating you to a meal. 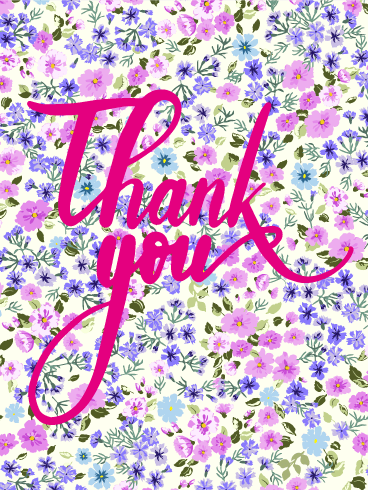 Whatever the reasoning may be, this Thank You card is a great choice and perfectly customizable. Sometimes we have trouble expressing our gratitude to those closest to us. 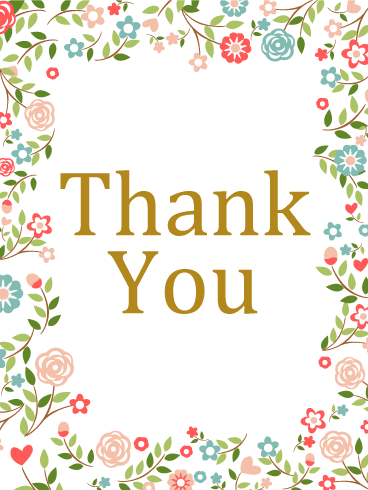 Overcome that hurdle with this fun Thank You card! The background print is eye-catching, and the words will let your friend know how much they mean to you. It's the perfect choice! This fun card is a can't-miss. Whether you're sending out thank you cards after a party, or thanking someone for thinking of you, this gold glitter card is bound to make anyone smile. Just look at that fun, bright background! 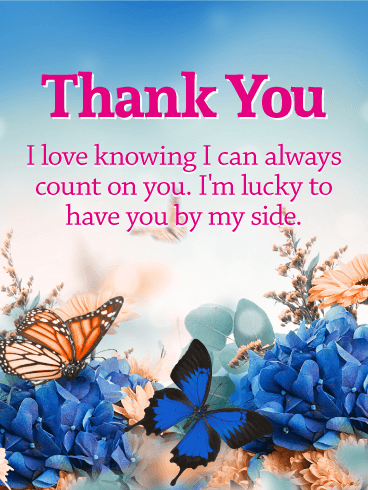 For that special person in your life who is always by your side, this Thank You card is a way to tell them how much they mean to you. You may not be able to afford a bouquet of flowers or a fancy gift to show much you care, but this is the next-best thing. After all, just look at those tulips! This Thank You card is the epitome of fun! But, more than that, it's perfect for any occasion. 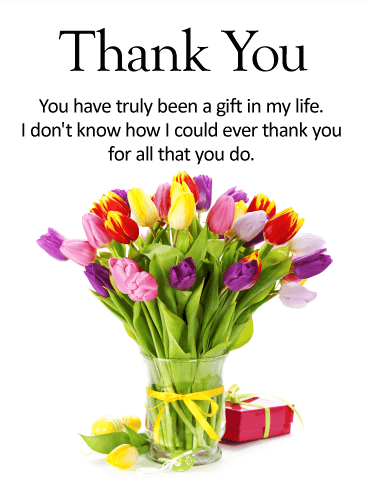 This can be used to thank someone for a gift they gave you, a time they were there for you, or even just for being in your life. It's the perfect choice for a fun-loving recipient! What's not to love about this Thank You card?! For starters, just look at those gorgeous flowers! They're the next-best thing to receiving a real basket of flowers. And the sentiment?! The absolute sweetest! This is a card sure to bring tears to anyone's eyes– tears of joy, of course! There's probably an unwritten rule somewhere that all of the cutest greeting cards must contain dogs. After all, is there anything cuter?! 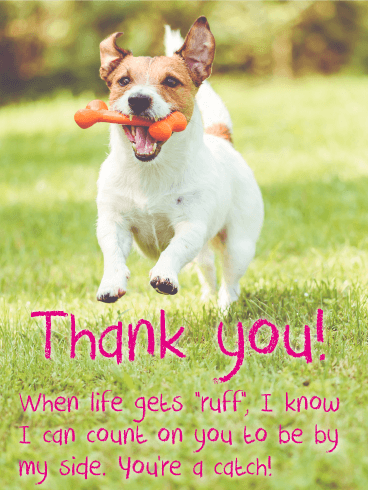 The pun about life getting "ruff" is tons of fun, and whoever you give this Thank You card to is sure to love it! 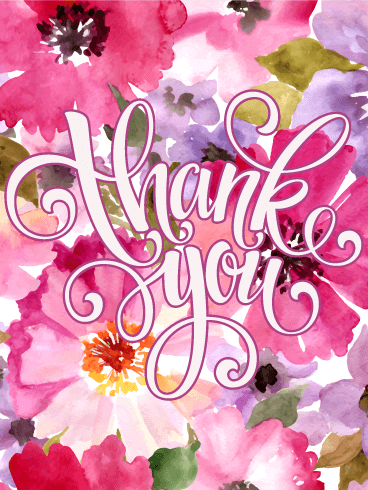 From the fun wording to the bright-colored background, you can't go wrong with this Thank You card. If you have trouble expressing your gratitude for someone, this is a great choice. It's heartfelt without being over-the-top, and you're sure to bring a smile to their face. 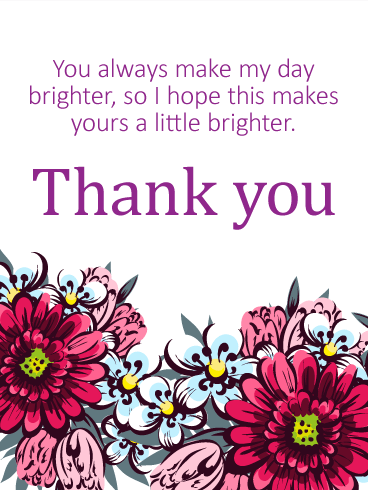 Just look at this bright Thank You card! It's the perfect choice for anyone you're thankful for, with the fun background, beautiful detail, and elegant font. 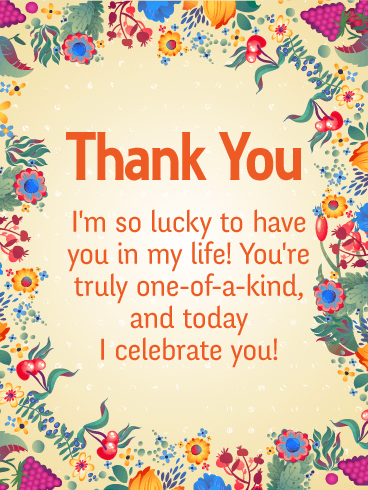 This Thank You card is suitable for everything from thanking someone for a gift, to just thanking someone for being in your life. Sometimes it's hard to find the words to tell someone you’re thankful for them. 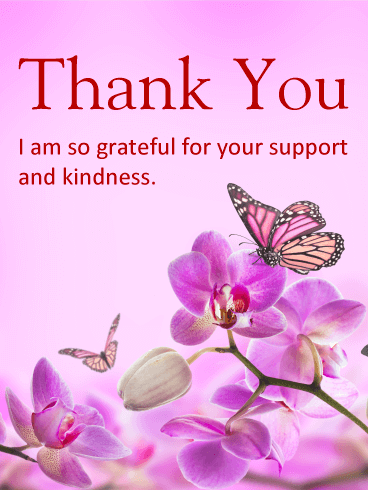 This Thank You card does the trick for you. The gorgeous flowers add elegance to it while the verbiage makes it suitable for almost anyone who has done something nice for you. No one should go through a tough time on their own. 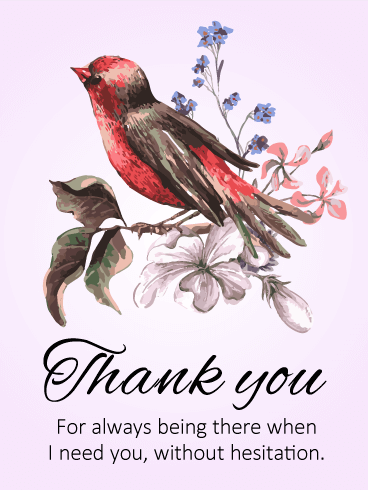 If you have a family member or friend who stands by your side and holds you up through your toughest times, let them know how grateful you are for their support with this Thank You card! 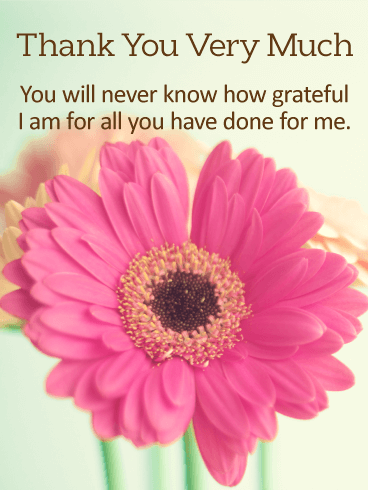 You can repay your loved one's kindness by showing them how thankful you are to know them. Send it today!